Alright, I am starting a log. Work was retarded today, so I wont workout this evening, but here is yesterday. Wow, I cant believe I forgot about my log! Well, last night was not exactly a regular workout. Me my brother and my friend "competed" in some events that my uncles taught me. Either way, I'm still tired! Earlier in the week, I did a couple workouts, but one in particular was really interesting. More because I was able to set some new records for myself, but also prooved that what I do must be working. We also did many other things, but these ones kind of sticked in my mind. 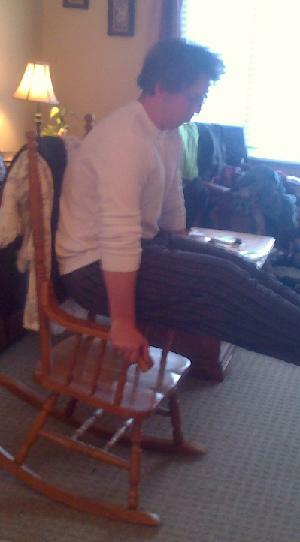 Not too easy on a rocking chair-it moves! It may look like I am touching the back of the chair, but that's just the blankets there on the back of the chair-an illusion. Today will be upper body hell, but I will post later.